Today in this post I will tell you how you can connect your YouTube channel with Google+. If you use Google’s new social networking website called Google+ and you all use YouTube to upload and to get new video updates. Now Google lets you connect your YouTube account with Google+ account so that you can view all the videos which your friends share on Google+ in YouTube homepage. To connect go to YouTube.com/account_sharing (if not logged in, then login to your account), then click on Connect link next to Google+ and it will get connected to your Google+ account. At this moment it doesn’t work in real-time so it may take a while to show the updates in your YouTube homepage. 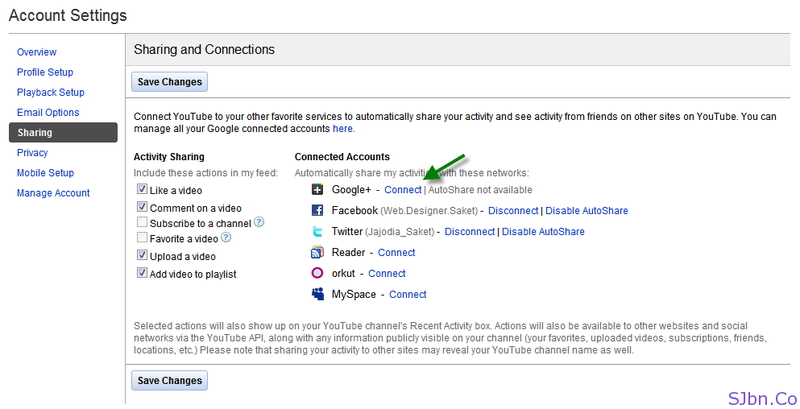 Unlike we can auto share with Facebook and Twitter, for now it is connected only to show shared videos on YouTube not to auto update your Google+ profile when you Upload, Like, Favorite, etc on YouTube.